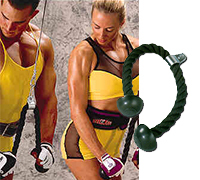 Tricep rope, molded double ball grip design with easy to handle rope. Great for exercising triceps, biceps, shoulders, abs. For use with weight stack cable equipment.